This picture is from Brandon Kovacic, a 2006 member of Pacific Crest. My name is Brandon Kovacic, and I aged out of Pacific Crest this season. 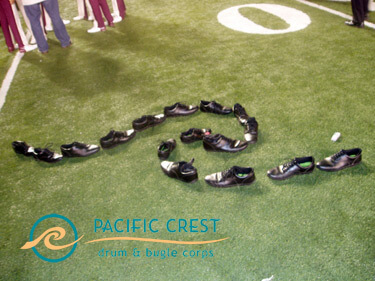 During the ageout ceremony at the 2006 World Championships in Madison, Wis., all of the ageouts decided to make the Pacific Crest logo with our shoes, This was the result. Thank you Drum Corps International and thank you Pacific Crest.